G-FORCE™ is a company built by Veterans for Veterans. Our franchises are all Veteran-owned and run with military precision. 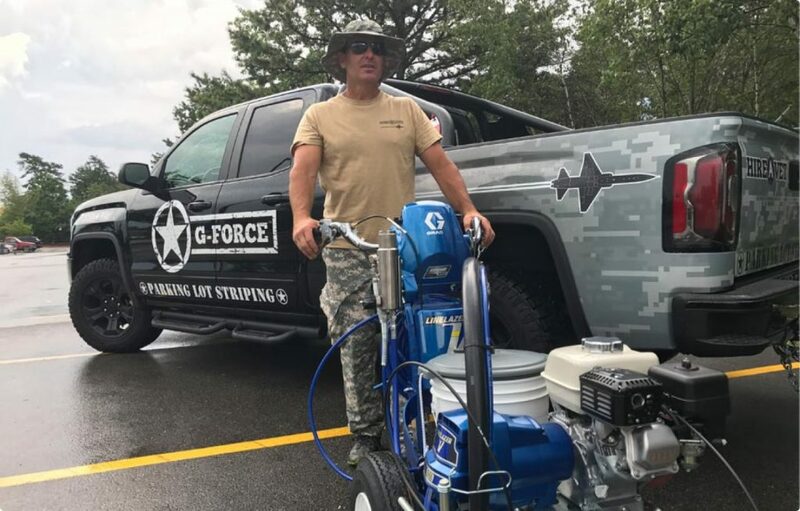 When you choose G-FORCE™ as your parking lot striping contractor, you’ll get neat, dedicated and reliable uniformed staff who are committed to professionalism, using premium traffic paints and equipment to ensure the best outcome possible. We serve southern New Hampshire, the seacoast of New Hampshire as well as portions of Maine, Rhode Island, Connecticut, Northern Massachusetts, Central Massachusetts, Greater Boston and Western Massachusetts. When you choose G-FORCE™, you get local parking lot striping experts who are committed to customer satisfaction. Parking Lot Striping, Pavement Markings, Athletic Field Markings, Warehouse Markings, Parking Garage Markings, Parking Lot Sign Installation, Hot Rubber Crack Sealing, Sealcoating, and Pavement Maintenance, such as Hot and Cold Asphalt Repairs. Note – Sealcoating, Hot Asphalt Repairs and Paving Services are provided through affiliates. Do you need your parking lot re-striped? Do you need numbers, handicapped parking symbols, or other services that personalize your parking lot such as Employee of the Month signage? We would be happy to provide a quote on asphalt marking and custom pavement personalization. Sealcoating and other maintenance services are also offered from G-FORCE™. Talk to us about preventative maintenance like sealcoating as well as pavement repairs. We work with a number of providers in these fields. Call or fill out our quote form for personalized attention and a quote from a nearby veteran striping contractor.